The drive into Marrakech is long and tiring, but the reward is sweet. The city has the most beautiful landscaping, tree-lined streets and buildings made from the pink earth. It is a romantic city, one with magnificent hotels and amazing shopping in the Souks. It is easy to see the disparity between the tourists that come here and the average citizen. The city is well-cared for, but one must feel sorry for the workers who serve the tourists in immense heat (120 degrees!) while fasting during Ramadan. They show incredible resilience. The air is filled with Arabic music everywhere you go. There is the calls to prayer and our schedule had to be adjusted for the daily forteur (break fast) at 7:45 pm. It is in this climate that we explored the city in all its rich glory. In the souks, we found incredible pastry shops and spice markets. We purchased fresh ground spices in amazing variety including spices for the most novice cook. The Moroccans use Tajines to cook traditional food, and they have special spice blends for fish, chicken, and beef Tajines. In the spice market they say these spice blends are for novice cooks that don't know how to use Tajines. Tajines for dummies? Tajines must be prepared for cooking by soaking them in cold water for an hour and rubbing them with olive oil. The key to Tajine cooking is slow cooking in the oven or on the stove or on charcoal for many hours. The technique is to line the bottom of the Tajine with vegetables like carrots and onions before adding the meat or fish because that way, if it burns, you don't burn the meat/fish. It's a technique Berbers and Moroccans learn at a young age. The markets also have an amazing variety of teas and items to heal various ailments. For example, they had jars of menthol to clear your sinuses, masks to rub on your face, and the men in our group were offered a natural remedy for Viagra. There are many women here who don't have any ovens, they bring their bread to a communal bakery to bake. Each family has its own mark to put on the bread. Fresh bread is plentiful and delicious. 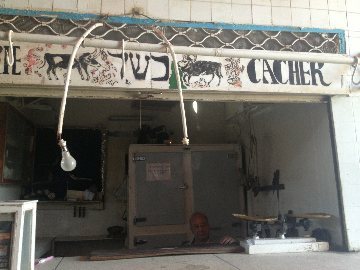 We found a kosher butcher! There seems to be no shortage of kosher food for Jewish travelers. There are synagogues to pray in and old age homes. There is so much fresh fruit that its easy to get freshly squeezed juices at any street market for less than a dollar. Besides cooking in a Tajine, which by the way, you can find all over, for $5-20 depending on your negotiating skills. The ones that are clay seem to break faster. The ones that are glazed seem to cook better. There are also Tajines designed for serving, not cooking. When one thinks of Mediterranean countries, they think of an assortment of salads called Mezze. We found Mezze everywhere! The salads were different, but some were not. For example, surprisingly, there was no hummus here or tabbouleh. Instead we found salads made in different combinations. For example we found cucumbers and tomatoes, sweet potatoes, squash, things that we didn't expect. We talked with local chefs and we're sharing some Moroccan cuisine in the coming weeks. Some recipes from morocco will be posted shortly for our recipe of the month for August. We also made a short video about our journey and we'll be posting it shortly. We hope you'll enjoy it!